Kate debuted a new pair of earrings from one of her favorite companies, Kiki McDonough, at a Westminster Abbey service to mark Commonwealth Day in March. The earrings, which are from the brand's KIKI Classics line, feature cushion-cut morganite drops suspended from white gold and diamond hoops. (The hoops and the drops are separate pieces; Kate often wears the hoops with other drops, including pearls from Annoushka.) The earrings retail at Kiki McDonough for £3,400. At the premiere of the latest James Bond film, Spectre, in October, Kate donned a pair of earrings that had previously been worn by her mother, Carole Middleton. The firm's girandole-style Pagoda earrings are made of white gold and set with diamonds and blue topazes. The earrings retail at Robinson Pelham for £14,300. Kate wore a set of vivid blue jewels at this March's service commemorating the British troops who served in Afghanistan. The earrings and necklace were made by the current crown jeweler, G. Collins and Sons. Both pieces are made of diamonds and tanzanites set in platinum. The set is not currently available for purchase, but here's a look at the necklace from the firm's archives. On Christmas Day, Kate brought out a brooch that she'd previously worn in May 2012: a diamond and pearl brooch set in various gold finishes that features oak leaf and acorn designs. The brooch seems to deliberately echo symbols from the Middleton family's coat of arms. Kate wore a number of pieces of royal heirloom jewelry for the first time in 2015, including these gorgeous sapphire and diamond earrings, worn at an October visit to the Victoria and Albert Museum. The earrings are from the collection of the late Queen Elizabeth, the Duke of Cambridge's great-grandmother. At the Chinese state banquet in October, Kate wore a number of significant jewels, including a diamond bracelet made from a choker necklace that belonged to Queen Mary, the current Queen's grandmother. The necklace appears to have been converted into a bracelet by the Queen Mother, who wore it on a number of occasions. Kate wore the piece at the banquet on her right wrist. Kate wore the gorgeous diamond and pearl Lotus Flower Tiara for the first time at the annual diplomatic reception in 2013, but this year, we got a much better view of it during the Chinese state banquet. The tiara was made by Garrard for the Queen Mother in 1923; they remodeled one of her wedding presents, a necklace given to her by her husband, King George VI, to create the new sparkler. The piece was also worn by Princess Margaret, who loaned it to her daughter-in-law, Viscountess Linley, as a wedding tiara in 1993. The most significant royal jewel loaned to Kate for the Chinese state banquet was, in my mind, the Queen's own Wedding Gift Bracelet. The bracelet, worn by Kate on her left wrist, was made for the Queen by Philip Antrobus Ltd. in 1947; it was a wedding gift from her husband, Prince Philip. 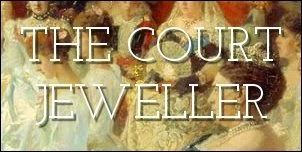 But the bracelet's diamonds are much older and more important even than that: they were part of a diamond and aquamarine tiara given to Philip's mother, Princess Andrew of Greece and Denmark, as a wedding gift from her uncle and aunt, Tsar Nicholas II and Tsarina Alexandra of Russia, in 1903. Alice had the tiara broken up to provide Philip with diamonds for his wife's engagement ring and wedding present. Kate's biggest jewelry surprise of the year was undoubtedly the debut of the Lover's Knot Tiara, a piece strongly associated with the memory of her late mother-in-law, Princess Diana. Kate wore the century-old diamond and pearl tiara from Queen Mary's collection to the annual diplomatic reception in December, proving that she's not shy about Diana's bejeweled legacy and that her access to important royal jewels is getting more and more extensive.